The Grace Brethren Church, Ashland, Ohio (Dan Allan, pastor), is marking their 100th year as a congregation in 2013. Here is a look back through the years — in words and photos provided by the church. A building on West 10th Street in Ashland was once home for the congregation. Grace Brethren’s milestone — a celebration of 100 years of ministry in 2013 — invites a look back at its century-long history. When Grace Brethren Church celebrated its 65th anniversary in 1978, the Grace Learning Center was dedicated, hymns of thanksgiving were sung and an evening Bible conference was held. But utmost on the minds of the members of the congregation and its pastor, Knute Larson, who served the church from 1968-83, was the evidence of the grace of God. “We’re 65 this year and feeling good about the future in the Lord Jesus Christ,” Pastor Larson said in a message in the anniversary bulletin. “His help has been so evident in the past,” he said. “The same real concern that moved (founders) Ard Blackford and Amy Greenlun to reach out to neighborhood children for a good afternoon Sunday School is the concern that today helps us stretch to Africa and Germany, Brazil and Mexico City, with our staff and our prayers, along with the support of the congregation,” he said. The first 65 years of Grace, like those to come, were characterized by service to others as “a way of life,” Pastor Larson said at the time. “People have shared their sure faith carefully, opened their homes graciously, given their money generously, sent sons and daughters unselfishly, prayed for direction regularly,” he said. 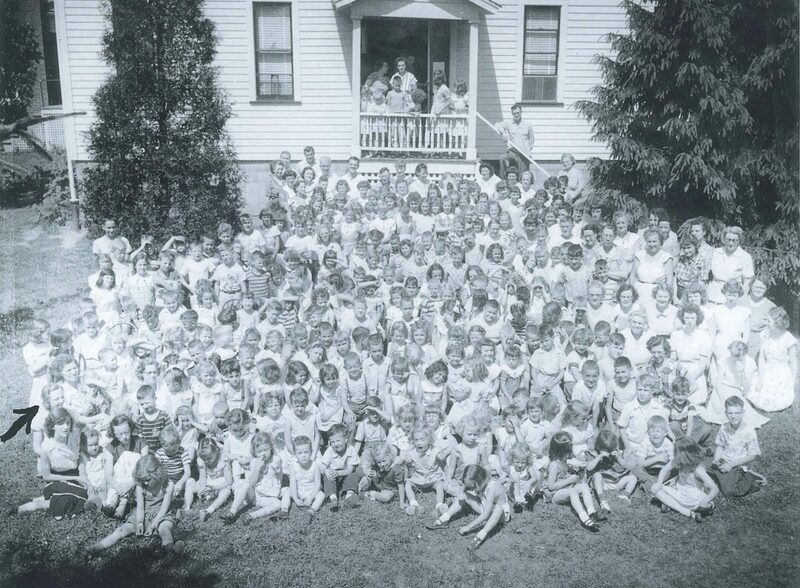 An early vacation Bible school at the West 10th Street location. Shull said Blackford sold a lot on West Tenth Street, purchased with a down payment of $500 loaned to the small group buying the property. 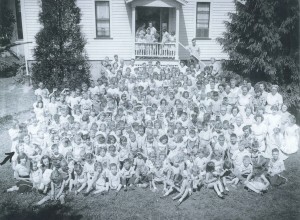 While the building was being constructed, Shull said, the fledgling congregation often met under the trees or in the home of Amy Greenlun, the children’s teacher. The dedication of the church, called Union Mission Chapel, was held on May 25, 1913, with about 100 people. The loan was repaid with “bake sales, chicken suppers, ice cream socials, quilt sales and tag days,” Shull said. Ray Klingensmith, Albert Flory and Robert Miller served as preachers in the early years of the church. 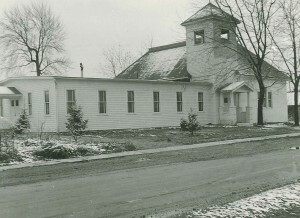 After being recognized by the Ohio District Mission board as an official Brethren church, its name was changed to West Tenth Street Brethren Church and a wing was added through labor primarily donated by members in order to save money and continue contributing to home and foreign missions, Shull recalled. According to other information saved by church members, there were three additions made to the building between 1938-44 and major remodeling undertaken in 1948. In 1944, Glenn O’Neal became the new pastor, followed by James Dixon in 1947. Because of increasing membership, the next pastor, Miles Taber, in 1951, preached in alternate services at the West Tenth church and a second church, called Southview, located on Katherine Avenue. One church in two locations continued under Pastor William Kolb in 1964, but when he left, the church leadership decided to make each building an individual church led by different pastors. Jack Peters became the pastor of the West Tenth church, until a new location to accommodate the growing congregation was sought. Knute Larson pastored the church from 1968 until the early 1980s. 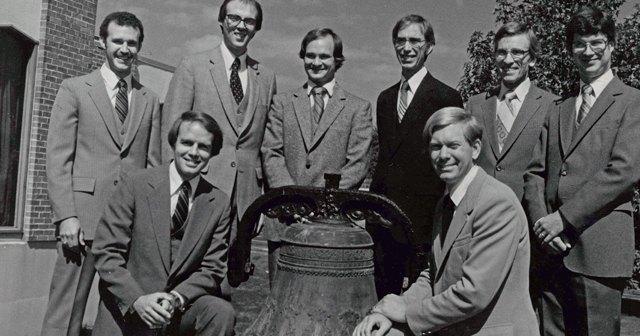 Here he is with his staff in the 1970s: Left to right – Gary Taylor, Knute Larson, Warren Jones, Chris Hayes, Howard Vulgamore, John Teeven, Doug Denbow, and Jim Currie. In 1968, Knute Larson, who had been serving First Brethren Church in Wooster as an assistant pastor, took the helm of the West Tenth church, advancing it once again. The new building was dedicated on Oct. 4, 1970; former pastors of the church sent their greetings. “We would join in with the many who are sending their greetings and congratulations on this special day, and we are praying that this beautiful building will be used of God in the preaching of the powerful Word that is able to turn men from their sin unto the Savior and for the edification of the saints … and all to the glory of our precious Lord and Savior, Jesus Christ,” Jack Peters said. “Memories still persist to remind us of days gone by when some of us were privileged to serve the Lord together in the dear old Mission now grown to be a larger testimony for Christ in Grace Brethren,” Robert Miller said. “May our blessed Lord and Savior continue to pour out His Spirit upon you all and give pastor and people productive years of service ‘til He comes,” he said. In Marabelle Shull’s history of the church, she said, “The church began a community ministry to teach all of life and learning from a Christian perspective,” beginning in 1973, with nine kindergarten students, Ashland Christian School. The Grace Learning Center was built in 1975, with an addition in 1978. Plans were made for a new worship center in 1980, and the first service was held in the new sanctuary on June 26, 1983. Pastor John Teevan began leading as Senior Pastor following Knute Larson’s departure in the early 1980’s. His ministry was marked as one that encouraged believers to “Count God in.” Among his passions were: That Grace would be strong in missions and be known as a “sending church.” Many of the church leaders of Grace in the 2000’s were trained and discipled by Pastor Teevan. “Come and grow with us,” he encouraged the congregation. In the 1989 directory, Teevan reminded members of the church’s commitment to salvation in Jesus Christ by His grace, the reliability and truth of the Bible, and the responsibility to teach, disciple, and evangelize people and equip them for ministry. 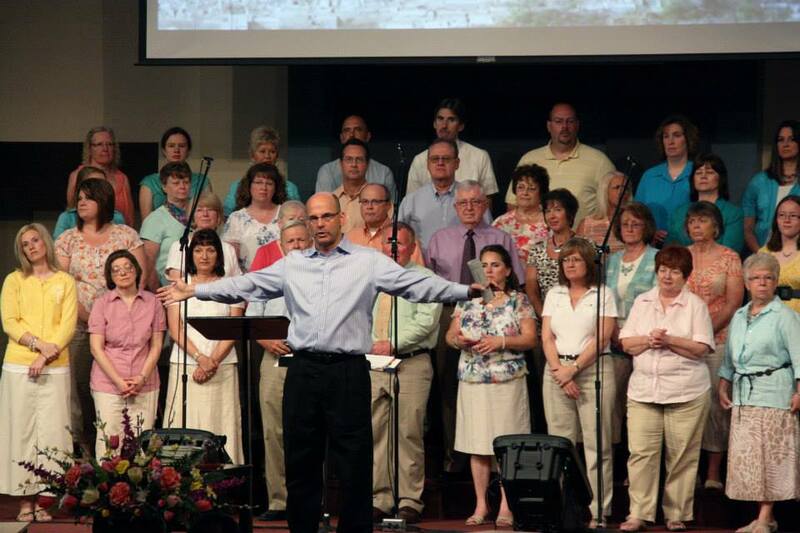 Dan Allan (center front) has led the church as senior pastor since 1990. He joined the staff as youth pastor in 1984. In 2001 the church faced another ambitious building campaign as a result of the growth of the ministry. In discussing the Stewardship of Life Campaign, Allan said, “Every Christian at the moment of salvation is gifted by God, given abilities and talents to be used for Kingdom agendas.” “First Peter 4:10 says that each one should use whatever gift he has received to serve others, faithfully administering God’s grace in its various forms,” he said. Just over a decade ago Ashland Grace planted a church in Strongsville, Ohio, Southern Hills Community Church, which later became an independent church. More recently Ashland Grace launched the EastGate Ashland and EastGate Mansfield churches. Ashland Christian School has continued to thrive as it has been nurtured by believers, and in 2012 initiated a high school program, Veritas Classical Christian Academy. Ashland Christian School will celebrate its 40th anniversary in 2013. Congratulations on 100 years of faithfulness. God bless you as you continue serving Jesus until he comes.